John Latouche. Click here to view a database of 21 Vernon Duke co-writers. 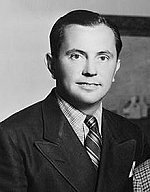 When Vernon Duke arrived in America, he immediately went to introduce himself to George Gershwin whose song "Swanee" he had heard in Europe. The meeting led to a friendship that lasted for the rest of Gershwin's life. "In his autobiography, Passport to Paris, Vernon Duke recalled how as a young man he desperately needed to earn enough money for a trip to Europe (pianist Artur Rubenstein had promised to play Duke's concerto in Paris that summer). Duke asked Gershwin if there was a task he could perform to earn the money, and Gershwin, rushing to complete the new edition of the [1924 edition of George White's] Scandals, let him ghostwrite a short ragtime ballet sequence for $100. In addition, he let Duke make the piano-vocal arrangements for several songs from the show, including “Somebody Loves Me.” Duke was especially proud of his Gershwinesque fills in the arrangement of this song. For this and the other arrangements for the show he received an additional $120." Click here for a database of songs written or co-written by Vernon Duke. Library of Congress--Music Division of: Collection Summary; Vernon Duke Collection (PDF, Adobe Reader required for collection, not for summary). Vernon Duke, Passport to Paris, Boston: Little Brown, 1955 (autobiography of Duke). David Ewen. American Songwriters , An H. W. Wilson Biographical Dictionary. New York: The H. W. Wilson Co., 1987 (includes 146 bios of composers and lyricists). -- a wide selection of used copies is available at abebooks.com (Duke entry, pp. 133-137). William G. Hyland. The Song is Ended: Songwriters and American Music, 1900-1950. New York: Oxford University Press, 1995 (multiple comments on Duke and on Duke and George Gershwin). Allen Forte. The American Popular Ballad of the Golden Era, 1924-1950, Princeton, Princeton Univ. Press, 1995 (multiple references to the musical structure of Duke songs, especially "April in Paris." Allen Forte. Listening to Classic American Popular Songs. New Haven: Yale University Press, 2001 (commentary on the musical structure of Duke songs, especially "Autumn Leaves"). Ken Bloom. The American Songbook, The Singers, The Songwriters and the Songs. New York: Black Dog and Leventhal Publishers, 2005 (Vernon Ducke -pp. 214-215). Wilfred Sheed. The House That George Built: with a Little Help from Irving, Cole and a Crew of about Fifty. New York: Random House, 2007 (multiple and extensive references to Duke). Thomas S. Hischak. The Oxford Companion to the American Musical: Theatre, Film, and Television. New York: Oxford University Press, 2008 (entry for Duke, Vernon).